As part of the U.S. Food and Drug Administration (FDA), the Center for Drug Evaluation and Research (CDER) promotes and protects the health of Americans by assuring that all prescription and over-the-counter drugs are safe and effective. The CDER evaluates all new over-the-counter and prescription drugs, including biological therapeutics and generic drugs, before they are sold. The 39 novel approvals for 2012 encompass a number of new cancer therapies, including Roche’s Erivedge, the first FDA-approved drug for late-stage basal cell cancer, the most common form of skin cancer, Genentech’s Perjeta, approved for the 20% of breast cancer patients with HER2 positive cancers, and Medivation’s Xtandi, approved for castration-resistant prostate cancer, one of a new class of drugs known as androgen inhibitors, designed to interfere with the ability of testosterone to bind to prostate cancer cells. Testosterone is the male hormone that fuels prostate cancer cell growth. A detailed list of all new approved therapeutics is shown in the table below. Positron Emission Tomography (PET) is an imaging technique that employs tracer compounds labelled with positron-emitting radionuclides as molecular probes. Once injected into a patient, the tracers are used to track biochemical and physiological processes in living cells. Two new PET tracers were approved in 2012: one for estimation of beta-amyloid neuritic plaque density in adult patients being evaluated for Alzheimer’s Disease and other causes of cognitive decline, and the second to help detect sites of prostate cancer. 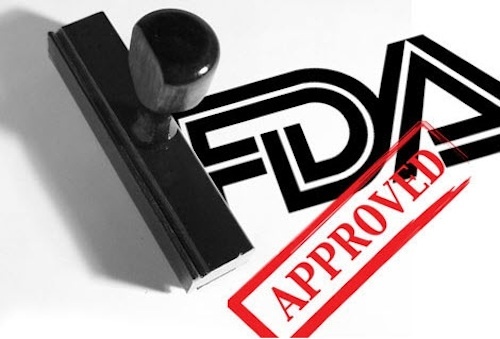 Additional novel products approved in 2012 include treatments for cystic fibrosis, HIV, irritable bowel syndrome, vitreomacular adhesion, glaucoma, seizures and rheumatoid arthritis. 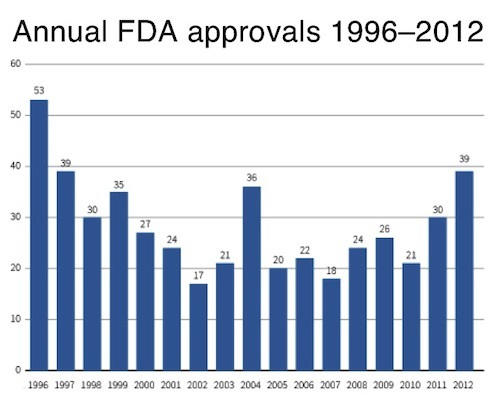 The 39 new drugs and biological products approved by the FDA for 2012 compares with 30 in 2011 and just 21 in 2010. At least 10 of the drugs had fast track status in 2012, which enabled them to be reviewed more quickly. Fast track is a process designed to facilitate the development, and expedite the review of drugs to treat serious diseases and fill an unmet medical need. The purpose of fast track status is to get important new drugs to the patient earlier. The rise of targeted therapies was also a significant contributor to the FDA’s ability to reach decisions quickly and efficiently. Genomics technologies today are a drug development tool that radically streamlines drug targeting and enables much more efficient clinical development in the patients most likely to benefit from the drug. In addition, two novel vaccines were also approved for use in 2012. Novartis’ Flucelvax is a seasonal influenza vaccine produced using cultured animal cells, the first alternative to the lengthy production of conventional flu vaccines in eggs. GSK’s MenHibrix is a combination vaccine for use in infants and toddlers aged 6 weeks to 18 months for prevention of invasive meningococcal disease. Zaltrap Used in combination with FOLFIRI chemotherapy (5-fluorouracil, leucovorin and irinotecan) for treatment of patients with metastatic colorectal cancer that is resistant to or has progressed following an oxaliplatin-containing regimen Sanofi-Aventis U.S.
Are the 90s Back? Oncologists Drove FDA’s 2012 Novel Approval Count to 15-year High. Pharmaceutical Approvals Monthly. Elsevier Business Intelligence. 2013 Jan.